Stat understands and appreciates the occasional need for additional equipment. It is our preference that our customers will own approximately the amount of equipment which they require annually, and certainly all of the equipment that they are entitled to as a result of manufacturer promotions. We understand your existing situation and will strive to gain additional equipment for you at minimal to no cost whenever possible. Stat is perhaps the largest independent distributor to the HP market, and we maintain approximately 400 Cholestech LDX and CardioChek units in our rental fleet. We will be happy to supplement your needs as required, understanding that advanced planning is the most effective means to always having the required equipment inventory available. Each program is designed to provide additional testing equipment according to your needs without requiring the use of your capital budget. 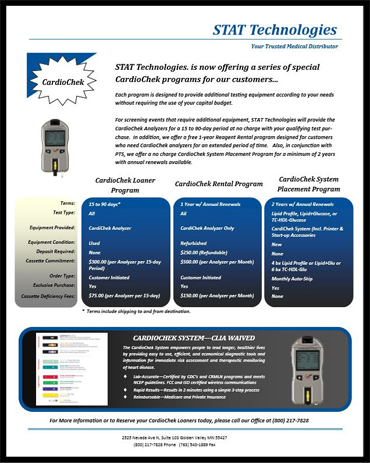 For screening events that require additional equipment, STAT Technologies will provide either the Cholestech LDX or CardioChek Analyzers for a 15 to a 90‐day period at no charge with your qualifying test purchase. In addition, we offer a free 1‐year Reagent Rental program designed for customers who need analyzers for an extended period of time. 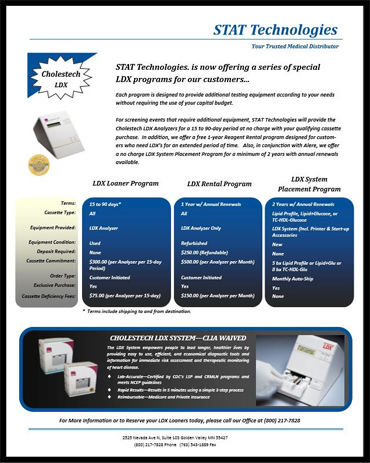 In addition to our rental program, STAT also works with Abbott, PTS and Siemens to offer a no charge Placement Program for the Cholestech LDX, CardioChek Plus or Siemens DCA Vantage analyzers. Please contact your local STAT representative for more details.